Welcome to Kaneohe Family Chiropractic. 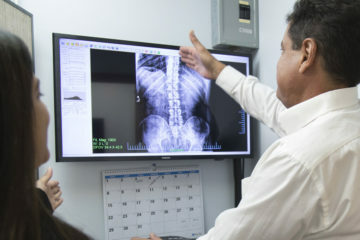 Our office offers state-of-the-art chiropractic spinal and postural correction. We incorporate the latest in digital x-ray technology and software to detect and correct spinal subluxation. Better posture and spinal health lead to a longer, more rewarding quality of life, and I can say that after 30 years in practice that the healthiest people on the planet are under regular chiropractic care. It is our practice model and philosophy that every family deserves to reach and maintain optimal health through consistent and regular chiropractic care for a lifetime at a reasonable cost. Consultation, Posture Exam, Full Spine X-Rays, & 3 Adjustments! I had such great results that I decided to continue and joined their memberhip program! If you're looking for a chiropractor who is friendly, thorough, a great listener and truly cares you need to schedule an appointment and experience it for yourself. Plus, validated parking and easy on-line scheduling is a fantastic bonus! Dr. Chip has been working with me to realign my spine. I have felt better and slept better for sure in the last few weeks. I track my sleep with my Fitbit, I am definitely getting more REM and deep sleep since being regularly adjusted. Restorative sleep is so important! Mahalo to Haunani and Dr. Chip! Dr. Chip is the best! His adjustments are quick and effective. My back and neck are benefitting from the luxury of frequent visits because the monthly plan lets you visit as often as you can without an appointment. So convenient. Thank you, Dr. Chip! It was first adjustment with Dr.Chip and I can actually say it works, he looks at what every patients needs and educates them on how to achieve a better posture. I appreciate the flexibility and availability scheduling appointments with them. Also the affordability with the service they offer. Always looking forward to future adjustments!